The mass extinction most of us are familiar with occurred about 65 million years ago and killed off the dinosaurs, but there were four previous mass extinctions in the history of the earth. Each of these appears to have been brought on by a natural event that caused a sudden change in climate. Species that could not quickly adapt to the new conditions died out. A growing number of scientists now believe we are living in a new geological era, the Anthropocene, which began about 8,000 years ago with the development of farming. Only after our descendants look back in thousands of years’ time will they know for sure, but the evidence for a new era is mounting. Humans have been affecting the earth’s systems for centuries now and have caused irreversible change to the climate at a pace too fast for many species to adapt. 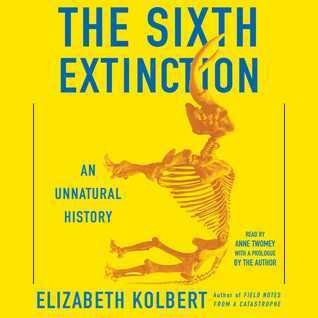 In this extensively researched book, Kolbert provides us with some history in the form of an overview of previous mass extinctions and the research of Darwin and Lyell, she closely examines a dozen recently extinct and endangered species, and details her travels across the globe to participate in field research with other scientists. This is a fascinating, balanced account of the current threat to the diversity of life on our planet. The author does not dispute that temperatures on earth have fluctuated in the past, which they have, but explains how rapid change can bring on mass extinctions. The melting of the polar ice caps, destruction of the rain forests, thinning of the ozone layer, the introduction of invasive species to other continents, high levels of carbon dioxide, which may be at its highest level in 15 million years, are only a few contributors to a rapidly changing climate. I was so engrossed in this book that I read it in only a few days. It is thought-provoking, at times scary and also sad for what we have lost and can still lose in our lifetime. Scientists predict that 30% – 50% of species could be gone from the planet by 2050, a stunning loss to diversity. This is not a heavy science book. While there are a lot of scientific facts contained between the pages, it’s a very readable and relatable book. I consider myself a bit of a science geek and loved every minute of it, but at the same time I would also highly recommend it to anyone with even a passing interest in the subject. It is that good. The book was read by Anne Twomey whose voice was perfect for the narration. Her pacing was steady and deliberate and her soft, melodic tones made it easy for me to listen for hours at a time. For me this was an easy listen but I also have a copy of the book to refer to for passages I wanted to study in more detail. I loved reading books like this in school and learning about our planet. Your review makes me want to pick up another one up. I would drive everyone crazy if I read this book. It sounds fascinating! I’ve heard others talk about how good this book was. Thanks for the informative review — I think I’ll definitely give this one a read. I’ve had my eye on this wondering if I should check it out. I know I have enjoyed reading about the past extinctions…..yet reading about the current one could be fascinating in a depressing sort of way.